There’s been lots of fanfare over China’s GDP overtaking Japan’s in Q2 2010 (coming hard on the heels of a big ruckus over its DF-21 “carrier killing” ballistic missile and rising tensions with the US over North Korea and the South China Sea). 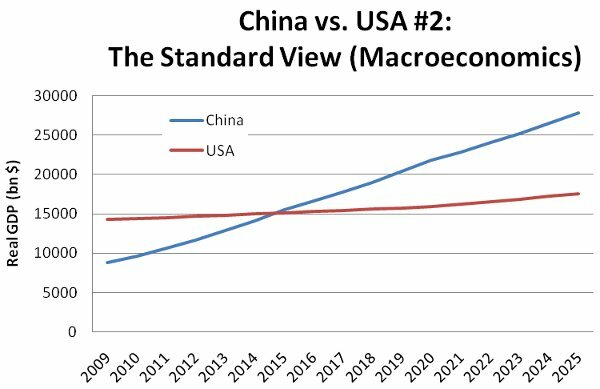 The big debate is now whether China will overtake the US as the world’s biggest economy by the 2030’s (as originally argued by Goldman Sachs in their classic Dreaming with BRICs paper), or whether its nomenklatura authoritarianism, centrifugal tendencies and demographic problems will preclude it from ever challenging Pax Americana. 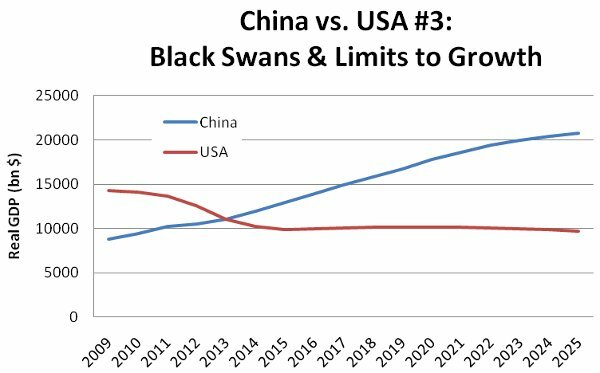 My view is that China is underestimated even by many of its proponents: underlying tendencies in world economics and energetics indicate that China’s GDP will overtake America’s before 2020, enabling it to emerge as the last superpower by the 2020’s. First, there is a major delusion that affects a disturbing amount of the commentary surrounding the size of the American and Chinese economies. Newsflash: nominal GDP and real GDP are different things! China overtook Japan in nominal GDP this quarter, but its real level of output has been the world’s second largest for almost a decade*. The reason China’s nominal, or market exchange rate, GDP is twice lower than its real GDP is because its currency is undervalued relative to the US dollar – simply put, living in China is a lot cheaper than in America. But it’s not an accurate proxy for the actual output of the Chinese economy, which is now at around 2/3 of the US level (IMF)**. 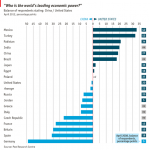 The “purchasing power parity” GDP is better suited for gauging a country’s real living standards and economic strength. Furthermore, many analysts are making the stunningly incompetent, sub-Econ 101 mistake of projecting Chinese’s 10% real growth rates to its nominal GDP. (Needless to say, this is totally absurd; China’s nominal GDP is growing much faster than its real GDP, because as it gets richer its price levels begin to approach those of the developed world). The convenient result of such calculations is to delay China’s sorpasso of the US economy decades into the far future. Applying linear projections of 10% growth for Chinese GDP and 3% growth for US GDP sees the Middle Kingdom overtaking its superpower rival by 2017. By 2025, China’s economy is 75% bigger than the US. Now one may make the entirely valid observation that linear extrapolation of current trends is bad futurism. I agree. China’s GDP growth will like moderate in the years ahead, as China develops and gets less bang for each investment yuan. On the other hand, there is still plenty of scope for rapid catch-up. China today is where South Korea was in late 1980’s and its trend rate of growth is slightly higher at 10% relative to Korea’s 8% from the 1960’s to the 1980’s. As China gets richer, this growth rate can be expected to ease to 7-8% (Korea in the 1990’s) and 4-5% (Korea in the 2000’s). The US cannot expect to see anything approaching 3% growth in the next decade. The realistic scenario is 1) a private sector deleveraging as households begin to rein back the debt-income ratios to some semblance of normality and 2) massive yearly budget deficits supporting a permanently weak economy at a 0-1% growth level. Think an American version of Japan’s Lost Decade. In the graph below, China grows at 10% until 2015, 7% until 2020, and 5% thereafter – roughly replicating South Korea’s trajectory from 1985/1990. 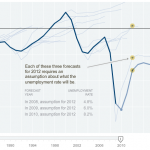 The US slugs along at 1% until 2020, then improves to 2%. In this scenario, China sails past the US in 2015 and is 60% larger by 2025. In reality, the world is far more complex than macroeconomics alone can describe. As I argued in Shifting Winds, American hegemony is metastable: though outwardly imposing, an interlinked failure in critical nodes such as energy (e.g. oil shock), finance (e.g. currency flight) and geopolitics (e.g. Iran) can lead to a cascading collapse of the entire system. Few will risk sticking their neck out with such predictions beforehand, but once the collapse becomes visible in our rear-view mirror, it will acquire the tinge of historical inevitability. The American service-based economy is reliant on cheap and reliable petroleum supplies to keep the office plankton fed and mobile, but is put at critical risk by the imminent peaking of global oil supplies. The financial / credit system relies on trust and belief (“credo”) in future growth to keep functioning as an economic fertilizer, but it is threatened by awning US economic disbalances and the possibility of disruptions in energy supplies. Finally, both the energy and the financial crisis can be triggered by a single geopolitical event, such as a successful Iranian blockade of the Straits of Hormuz (e.g. in retaliation for an Israeli strike against its nuclear facilities). The risk of cascaded collapse would not exist if Pax Americana faced fewer challenges, or if its foundations were still strong and wholesome. They are most definitely not in our era of permanent deficits, tight oil supplies and imperial overstretch. In the worst case scenario, this collapse could manifest itself in a fall in GDP of up to 30% to a new “steady state” output level. But at least the US will recover quickly, right? Not likely. Though a US dollar collapse will restore competitivity to some of its older industries, global resource constraints will prevent it from ever fully recovering. Why should increasingly scarce energy sources continue feeding the office plankton of American suburbia, as opposed to Chinese factory cities whose products the entire world wants? Contrary to popular commentary, China is unlikely to be hurt much by an economic collapse in its prime market. Net exports only account for 7% of China’s GDP, so though exports will decline, so will the imports used to assemble exports, and the overall effect will be modest. Though ebbing US demand for Chinese goods will hurt coastal regions, create unemployment and incite low-level protests, it is unlikely to reach a critical level since China can refocus development efforts on the interior and raising domestic consumption (there are numerous signs that this is already happening). China’s biggest challenge will be the peaking of its coal production and AGW-induced declines in crop yields within ten to twenty years. Mitigating these developments will require a great deal of capital and ingenuity, things China is fortunate to have in abundance. Ultimately, with 20% of the world’s population but just 7% of its arable land, the Limits to Growth may cap China’s peak GDP at not much more than America’s current level. On to our third scenario. From 2011, some combination of critical system shocks initiates a cascading collapse of Pax Americana, resulting in a cumulative US GDP decline of 30% from peak (this is similar to Latvia’s collapse in 2007-2009). After that, there is a permanent zastoi – unlike in previous emerging market crises, a significant recovery will be impossible in the new world of neo-mercantilism and energy constraints. 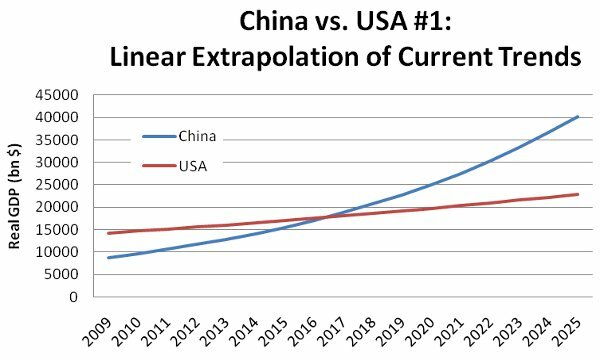 China will be able to leap past the US sometime around 2013-15 and grow to more than double its size by 2025 – despite the slowing of China’s own growth due to peak exergy and the natural effects of economic catch-up. What is the probability of each of these scenarios happening? In my opinion, Scenario 1 is pure fantasy. Scenario 2 is what I’d vouch for in “respectable” conversation. Scenario 3 is what I really believe will happen (and what I tend to write about on this blog). In any case, the general outline is clear: no matter which “prism” you see the world through – be it techno-cornucopian, “realist”, or peakist – it appears that China, by sheer virtue of combining 1.3bn souls with modern technics, is destined to soar past the US to become the leading pole, if not of the world system, then certainly of the Pacific region. This breakout will be all the more dramatic under the American collapse scenario: wracked by internal decline and preoccupied with internecine politicking, it’s not impossible to imagine the US simply not noticing the ebbing of its influence in East Asia. 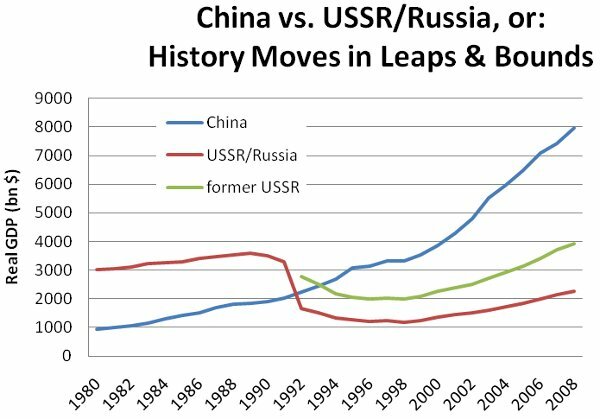 Of course, there’s a perfect precedent for this: see how post-Maoist China managed to break past the seemingly impregnable Soviet empire that collapsed into anarchic stasis in the early 1990’s. [Angus Maddison’s data adjusted to equalize with IMF 2008 data; note that “former USSR” is a very rough estimate]. * There’s a big debate on the reliability of official Chinese economic statistics. Are Chinese statistics manipulated? by Gao Xu is a recommended rebuttal h/t “in the loop”. ** That is also assuming that the 30% downwards revision to Chinese GDP by the World Bank and IMF a few years ago was well-founded and not undertaken out of political considerations to preserve America’s #1 status. If not, China’s real GDP may already be surging past America’s.